The Chatterbait came onto the bass fishing scene around 2004 and has never looked back. There were a lot of skeptics who thought this would be another “helicopter lure” or “banjo minnow” type bait. I was introduced to this bait by a friend of mine named Jimmy Mize. At the time Jimmy was a Bassmaster Elite angler and had qualified for several Bassmaster Classics. I will admit, I thought it was a gimmick myself. By the end of the day, he had caught 4 to my 1 as I was using a spinnerbait. He told me the Chatterbait was in fact a “4 wheel drive lure”. You can throw it anywhere and it won’t get stuck. 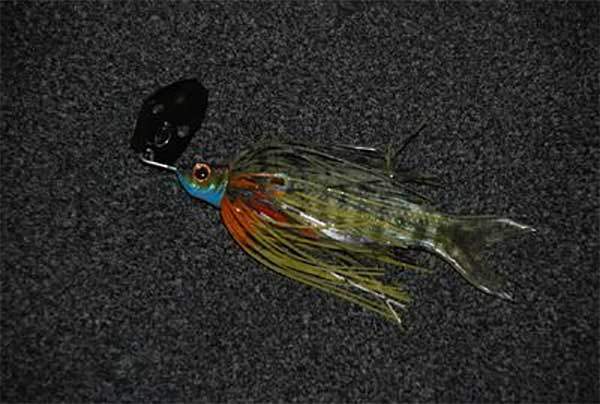 Since then, numerous other companies have made their own version of the bait and now they are called “bladed jigs”. These baits are a main stay on the deck of my boat in the spring through early summer. I will go over my favorite colors, tips and trick for throwing a chatterbait. Colors and Size- I try to keep it fairly simple when it comes to colors. I throw green pumpkin, white/charteuse and black/blue. That is pretty much it as far as color is concerned. My personal favorite would be the green pumpkin with a black blade. As far as blade colors, I typically use black, gold or nickel. I like a 3/8 ounce for most of my spring time fishing, but will occasionally throw a ½ ounce bait if I am fishing deeper than 10 feet. Trailers- I believe that your trailer can make or break you when it comes to a chatterbait. When the bass are keying in on shad, I like to use a trailer such as a Reactions Innovations Skinny Dipper, Zoom Swimming Fluke or a Gener Larew Sweet Swimmer in a white, silver or chartreuse color. These trailers will give my bait the extra thump as well as a swimming profile. If the bass are feeding on bluegill, I will reach for something like a Big Bite Warmouth or a Keitech Fat Impact bait. These baits have a slightly larger profile and will add a bit of bulk to my chatterbait. I always keep my I Spike it dipping dye handy to add some chartreuse or orange color to my trailers as well. How to work it- In my opinion it is totally situational. If I am fishing lily pad stems, I will cast the bait out and as I hit the stems, I will twitch the rod tip to produce some bone jarring strikes. If I am fishing a hard shad spawn, I will throw the bait almost on the bank and do a burn and kill retrieve. If you are fishing boat docks, I want to throw it back as far as I can and use a steady retrieve until I am almost out of the dock, then I will kill it for a second then start reeling fast for a second. When to throw it- This bait is known as a spring and fall bait primarily. However, more and more people are throwing them into the summer and early winter. I have seen 1 ounce chatterbaits that can be used like a 1 ounce slow rolled spinnerbait on Falcon or Amistad. My best luck on a chatterbait has been February- June. That is not to say you can’t catch them other times, just that has been my experience. Grass is the Juice- When you can find some type of underwater vegetation, you have found the “juice” for a chatterbait. Bass will always be in the grass, since baitfish will use it to hide form them. Try and let the bait come in contact with the grass, then rip it out and repeat. Or, you can let it sink to the bottom and try to power the bait through the thick stuff trying to provoke a strike. Equipment- I typically throw a chatterbait on 14-17lb fluorocarbon. You may use slightly lighter or heavier given your body of water. I usually fish Fork, Toledo Bend or other lakes that have a lot of wood and big bass so I opt for the bigger line. I like a 7’3” IROD Stone cold spook and trap rod for chatterbaits. It is a Med/Hvy rod with a fast action tip. It gives me plenty of backbone without sacrificing sensitivity on the business end of things. I know there are many other ways to fish chatterbaits than I have listed here. I just hope a few of these tips and tricks will help you catch a few more fish the next time you are out. Maybe one of these tips will help you cash that check at the next tournament. There is no substitute for time on the water, so tie on a chatterbait after you read this and head to the lake! !